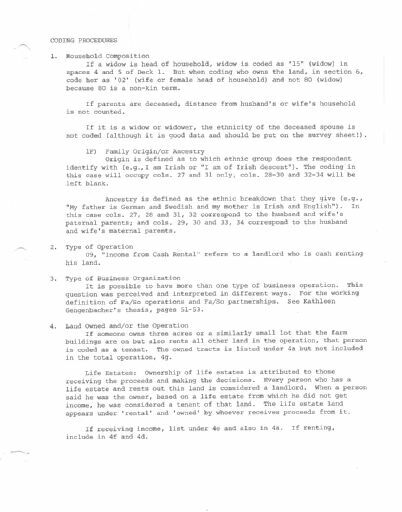 Born digital records from the Sonya Salamon Papers contain field notes, research notes, survey notes, survey codes, survey instruments, forms, and spreadsheets, relating to rural communities in the US, including ethnic backgrounds, farming practices, land ownership and transfer, rural households, sustainable agriculture, farms organization and operation, family/community interface, religion, marriage patterns; as well as women and family in Japan and Germany. Materials include handwritten and typewritten documents that were digitized by the creator, NOT by the University Archives. Note: Some materials are restricted. Access copies of non-restricted materials are available upon request. The Sonya Salamon Papers (Born Digital Records), 1978-1997, 2000, 2005-2006 are managed by the University of Illinois Archives and do not feature precise descriptive information for each item. Discover their contents by browsing the folders and files. For more information, contact an archivist at illiarch@illinois.edu.